A good interior design that will match well with the younger generation sense of style can be achieved by using a suitable furniture design, perfect light set up and great choice of music that can create the perfect mood setting that people will enjoy and feel at ease to enjoy all night long. With all the unique and different design that can be used for night club our client favor modern theme that used black and red as the dominant color. Modern theme is the most popular and fitting for night club bar design and by using red and black color it leaves a strong impression and the same time its showcase luxury and classiness that can be appreciated by everyone. Using a bright red carpet for floor covering can surely make a statement and stand out more compared to other night club design. 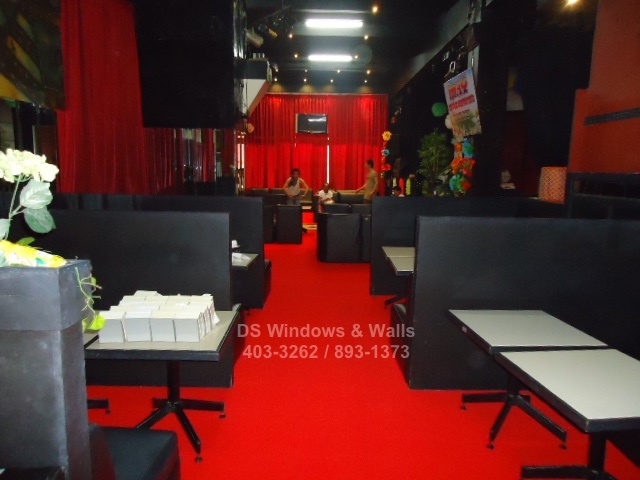 Bright red carpet for bars produce a very red-carpet-premiere look that’s oozing with elegance appeal that will surely attract a lot of attentions and suits well for VIP rooms like in the picture you see in our client’s nightclub bar. 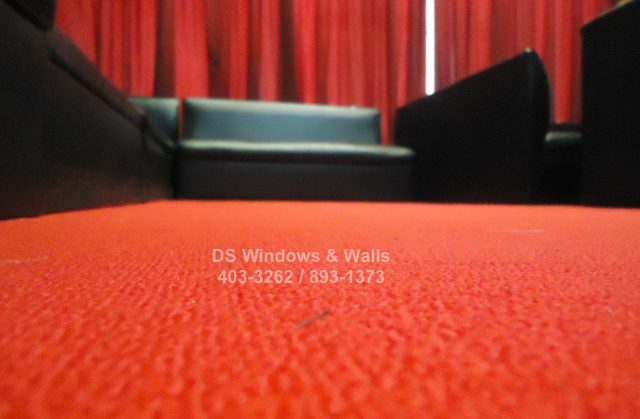 It adds more uniqueness and exclusivity atmosphere for VIP rooms by just adding red carpet on as the floor covering. It’s also very comfortable on the feet specially for girls who love to party and they always wear high heels and carpeted floor can help their feet feel more at ease. 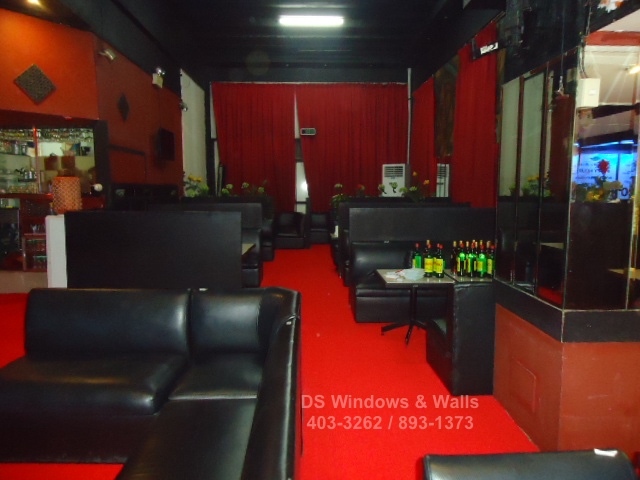 Our client matches red carpet and curtains in black leather couch that highlight the modern theme look and add more excitement, coziness and luxury feel in the room. The comfortable and luxurious feeling of great furniture design and the exciting atmosphere that only this type of flooring can provide brings a one-of-a-kind experience for the party people who’ll enter this night club bar. 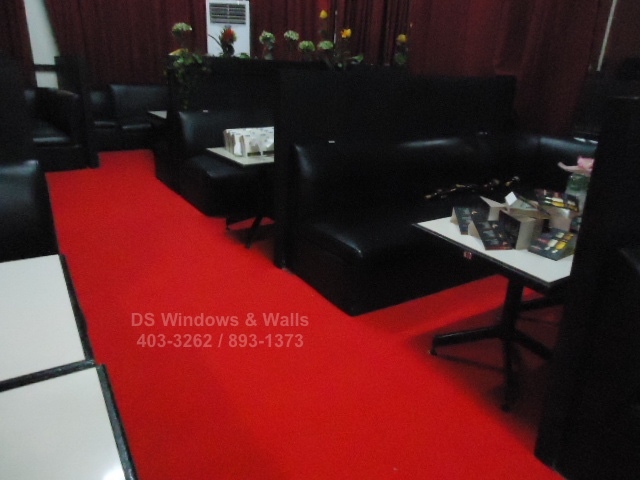 We at the DS windows and walls introduces the glam up of the night club bars, bright red carpet, also if you want to build in your own homes a night club bar inspired bright red carpet floors, we can easily do it for you.